When we called the Kern River Fly Shop about a week before our scheduled trip to fish the Kern, we talked to Guy and Kimberly and they forewarned us that the Kern was flowing high and fast and that we would likely have to fish some of its tributaries. After we arrived in the area and hooked up the SaraLinda, we headed to Kernville just to look around and grab some groceries. As we crossed the Kern river in town, we looked down and saw just why they’d prepared us to fish the tributaries; it churned wildly and looked like chocolate milk. The next morning, when we arrived at the fly shop, we met Guy and Kimberly and talked about our day; we’d be fishing several “nunya” creeks that are a part of the Kern drainage. We left the shop in Guy’s 4×4 truck and headed up Mountain Highway 99, a road that parallels the Kern River. As we climbed higher and higher, the Kern flowed even faster as it tumbled down the riverbed and in many spots, overflowed its banks. The landscape changed as we crossed the Kern River bridge, becoming a beautiful forest on both sides of the road, and we climbed even higher into the Sequoia National Forest. Guy was really kind to us, taking us to some “secret” spots where we would be fishing in beautiful surroundings for Kern River trout and golden/rainbow hybrid trout. Barb and I both love fishing tributaries to larger streams that hold beautiful smaller fish. I was using my 4wt rod and Guy had Barb using a Reddington Trout Classic 3wt, which would ultimately cost us, as Barb loved the 3wt so much, we got one the next day. We had an absolute blast fishing these small creeks with Guy, walking from hole to hole, eating lunch right on the banks of one creek and getting a double right after lunch…both Barb and I with a fish on at the same time. FUN!!! We interviewed Guy in a stand of huge pine trees after a great day on the water. We know you’ll enjoy his “Guide Talk” interview as Guy is a great guide, and as we found out, a man of many talents. Enjoy and as always…. The first thing we noticed as we explored the Upper Sacramento, or Upper Sac as it’s better known, was that most everywhere you looked at the water, if you looked up, you’d see Mt. Shasta. The mountain dominates the landscape in this area, and was actually visible from three of the four rivers we fished. I think the only reason we didn’t see it from the McCloud River was that the McCloud River Preservation trail was closed (aka. under water) so we couldn’t get to a vantage point. Even as you drive up and down I-5, Shasta is either in your windshield or your rear view mirror. The picture above was taken from a pedestrian bridge on the Upper Sac. Fishing the Upper Sac was another story all together. Our first attempt was with our guide, Matt Dahl. We looked at the river in three different locations, gave up due to the VERY high flows and went to the Lower Sac. 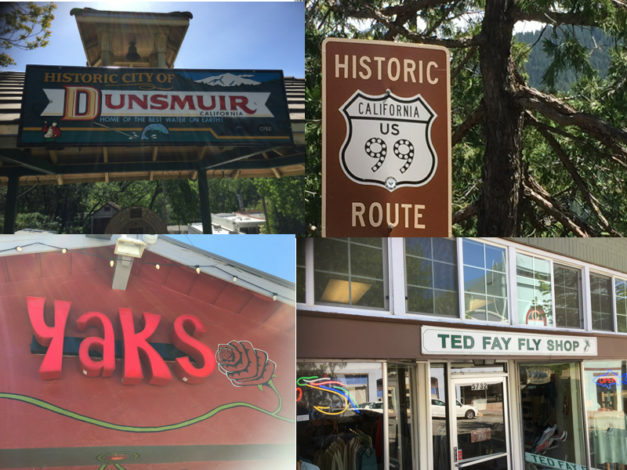 The next day, Barb and I decided to go to the historic little town of Dunsmuir, to the Ted Fay Fly Shop. We talked with Bob in the shop about where we might try to fish and as he was giving us some suggestions, another patron, Andy, told us what had been working for him and that he’d caught fish the day before. After getting some flies from Bob, off we went to the river where the first image was taken. As we were walking out of a spot we tried to access the river, we ran into Andy. Andy told us to follow him and he’d show us a good spot to fish. We followed Andy, and actually went back to one of the access spots Matt had stopped at originally, but Andy walked upstream a bit and showed us an “easy” access spot to scramble down to the river from the railroad tracks. While we didn’t fish there that day, even though Andy invited us to join him, we made note of the spot and would return later. We decided to go back to Dunsmuir for lunch at Yaks, which was voted by Yelp as one of the “Top 100 Restaurants in America”, 2015 edition. Yaks is very cool place with incredibly unique and awesome burgers. They had a pretty good selection of local brews as well. We left stuffed and happy as we went to try a couple of other spots, but to no avail; the river was just too high and fast. The following day, after we’d fished the McCloud with Ernie Dennison, he took us over to a different spot on the Upper Sac near the town of Mt. Shasta. The river was still raging as we tried one particular spot and still, no fish. Back we went the next day, with the flies in hand Bob had sold us, and directly to the spot Andy had shared. 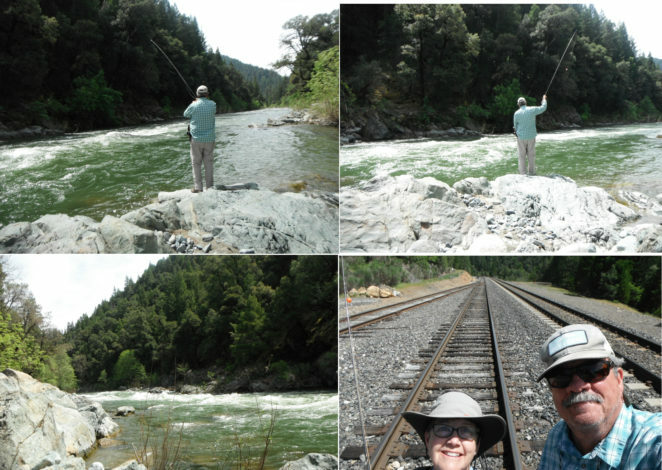 We crossed the railroad tracks, scrambled down the path to the river and set to fishing on the rocks above the river (see pic 3 above). After getting the right amount of line out, setting up our nymph rigs deep, we started casting out toward some large rocks submerged under the water. BOOM…. first one, then two fish hit our flies and we’d scored our Upper Sac rainbows…. no “Skunking” on the Upper Sac. After catching our Upper Sacramento rainbows, it was back to Dunsmuir, only this time, for a picnic lunch at a park by the river. 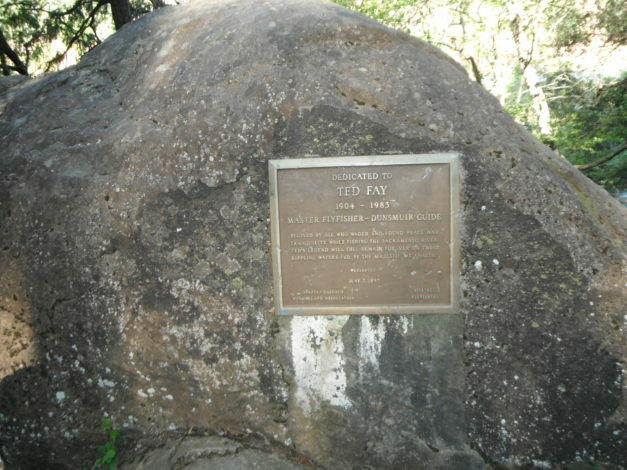 The park had numerous plaques on rocks and picnic tables commemorating area anglers who’d made contributions to the community and river. One of the most famous of those was Ted Fay, whose fly shop in Dunsmuir we’d visited. All of the plaques had wonderful thoughts and sayings on them that reminded us of the beauty, tranquility and peace to be found in the art of fly fishing and the outdoors where these streams flow. We’ll not ever forget our time here in the “North State” as locals call it. After spending a couple of weeks here in the area, we’ll also always feel Shasta is watching over us as our River Ramble adventures continue. A few days before we met our guide to fish the McCloud River, we decided to take a drive out to the stretch of the river we’d be fishing. As we drove along the McCloud Reservoir on narrower and narrower winding roads, with gallon jug size rocks that had fallen down the mountains onto the roads, we began to wonder when we’d get to the dam and then finally downstream to the river. 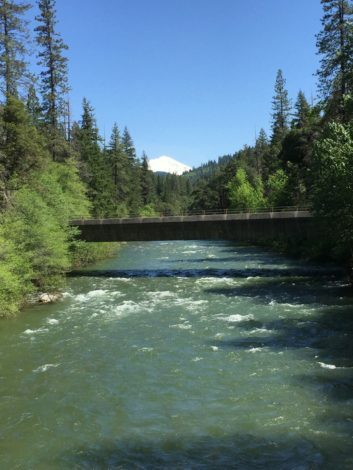 At one point, we saw a sign pointing to Ah-Di-Na Campground (7 miles) and the McCloud River Preserve (8 miles) and decided to take it, having heard that some of the best fishing was there. About a mile into the drive, we decided the road was far too rough and scary and turned around, returning to the paved road that wound above the reservoir. Another several miles on the road finally brought us to the dam. We crossed the dam and headed down a gravel road, high above the McCloud River. As it wound further and further, we found several crossings of the Pacific Crest Trail. We decided to take the trail and it led us down to the river and to a foot bridge that crossed the river. As we’d been informed, the river was running high and fast, but we still had to “wet a line” even though we would not go with a guide until the next day. We caught nothing on that exploratory visit to the McCloud but were in awe of its beauty and majesty. The next day we met our guide, Ernie Dennison, from The Fly Shop in Redding, CA, at 8am. We headed back to the same bridge, along the Pacific Crest Trail, we’d visited the day prior. This time, Barb hooked up with a small McCloud strain rainbow under the bridge. We stayed there and fished a bit more before checking out a few other possibilities, all of which were too dangerous to fish. As we learned from Ernie, normally the McCloud River flows at about 200 cfs (cubic feet per second); the highest he’d ever guided anyone on the river before was at around 700 cfs. On our river day, it was flowing up over 1000 cfs, which was the highest Ernie had ever attempted with clients. Safety was our biggest priority, and Ernie found spots that kept us safe, but allowed us to fish on the McCloud. We decided to drive to the Ah-Di-Na Campground for lunch and off we went, down the same road that we’d decided was too treacherous the previous day. We figured, if Ernie was headed down, we were going right behind him, even though another angler we’d talked with, while recommending the fishing near Ah-Di-Na, also described it as “the road from hell”. Ernie later described it as the longest 8 miles of driving he’s ever encountered. After about 25 minutes of bone rattling driving along “TRFH’, we made it to the campground, had lunch and hit the river near the campground. We both hooked into fish in this spot and had a great time. Next, we drove another mile to reach the trail to the McCloud River Preserve. The Preserve is another Nature Conservancy project similar to where we fished Silver Creek in Idaho. We hiked the Preserve trail for about 15 minutes before coming to a spot where the trail disappeared into the river, which again was raging downstream, so, we turned around and bid adieu to the McCloud. We ended up heading over to the Upper Sacramento River since Ernie knew a spot he thought we might be able to fish. A couple of days prior, Matt Dahl had tried to get us on the Upper Sac, but it was too dangerous to even get close. While Ernie had found a couple of spots for us to test, the fishing just wasn’t great. It was a gorgeous day, so we decided we’d sit down with Ernie along the Upper Sac and chat with him about the McCloud, and many of the other fisheries in the Redding area. Ernie has been guiding for The Fly Shop for nearly 30 years and really knows all of the waters nearby. We quizzed him on not just the McCloud, our focus for the day, but also all the other area streams. We know you’ll enjoy his take on fishing, life, beer, more fishing and having fun while learning on the water. Please click the video above to hear Ernie’s wisdom. We met our guide for the day, Matt Dahl from The Fly Shop in Redding, at the Chevron at the Castella exit off I-5. We’d already fished with Matt over on Hat Creek and were looking forward to another day with him on another river. After a quick discussion about where to fish, we headed off to Dunsmuir, CA, to a local park with several plaques commemorating anglers who’d made contributions to the community and to the sport. One of the biggest names in fly fishing in this area is Ted Fay, a master fly fisherman and guide. A fly shop in Dunsmuir still bears his name. While the park in Dunsmuir was beautiful, one look at the cascading waters of the Upper Sacramento, or Upper Sac as it’s known, told us all we needed to know; don’t fish here, but, if you do, don’t step into the water for fear of getting swept away. We quickly decided to look for another spot on the Upper Sac we might approach. Down I-5 we went to the Sims exit, out by some railroad tracks, and we found the same situation, a raging river. At this point, Matt indicated that finding fishable water on the Upper Sac was going to be difficult, so we headed down to Redding to fish the Lower Sacramento. Matt went and grabbed his drift boat and we met him at the famous Sundial Bridge. After getting our steelhead licenses (no we weren’t fishing for steelhead but because steelhead might be in the river we had to get them), we oared our way out into the Lower Sac that was flowing pretty fast itself, at 13,000 cfs. It wasn’t anything you’d want to try and wade into, but in a drift boat, it was safe and we were off. Nymph fishing was the order of the day on the Lower Sac, so with a 3 fly rig, we starting searching for the big rainbows the Lower Sac is known for. Luckily, we found a few along the way and had a great day fishing with Matt. Our interview with Matt was done right on the banks of the river with the Sundial Bridge in the background, along with some wind and noisy horses. We hope you enjoy our interview with Matt on fishing the Sacramento. We even tried to coax him into revealing some of his favorite “nunya” streams, but to no avail. Cheers Matt! When we first arrived in Northern California, we drove out to the location we were going to meet our guide for the Fall River. We were meeting him at Glenburn Church just outside Fall River Mills, CA. Many of the fields were flooded, but not because of weather, but because they were rice fields. Turns out the area is known for its wild brown rice. It’s also known for the Fall River, which we found was a slow moving river that meandered through the farms and fields. The next day, we met Matt Mitchell, our guide from The Fly Shop in Redding. It was a beautiful, warm spring day in the Fall River valley. He met us at the church at 8am and off we went to put in. Instead of the drift boats we usually find ourselves in, we were in a “john boat” outfitted with a regular and trolling motor. The boat was really special, it was originally Matt’s granddad’s. The “speed limit” on the river was 5mph so we also slowly worked our way upstream. The river is really more like a giant spring creek, and that morning it was like glass and gin clear. As we made our way upstream, we had to go under several farm bridges, which required us to duck in most cases, except one where we had to lay down in the boat to make our way under it. Matt described how he’d once not ducked quite low enough, showing us the mark still on his ear. Once under that last farm bridge, we setup our fly fishing rigs and proceeded to hunt for Fall River rainbows. After a day on the water, we had a chance to interview Matt about fishing the Fall River. We hope you enjoy the interview as much as we enjoyed our day on the water with Matt. I just wish I had that fly line tangle picture still. You’ll know why if you watch the video.